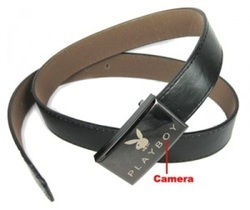 This belt buckle featuring the iconic bunny is impressive enough without the built in camera. You'll be able to slip right into a club or party scene without anyone suspecting you're recording quality color video footage and audio. With support for up to 16 GB Micro SD cards, you'll be sure that it won't miss a moment of the action.